A talented, dangerous forward from Ganmain - near Wagga Wagga, NSW - Tom Carroll was recruited twice by Carlton before he established himself in the Blues’ senior team in 1961. Because his family farmed turkeys, he was nicknamed "Turkey Tom" by the Melbourne press - something of an ambiguous label, but one that Carroll accepted it in good spirit while becoming a star goal-kicker for the Blues over three seasons in the early sixties. The youngest of seven sons in a football-mad family, Tom played at half-forward in Ganmain’s 1956 and ’57 South West League Premiership teams prior to his 18th birthday. In 1959, he was invited to Princes Park for the first time, and was trialled in two Reserves games on match permits. Although he showed potential, he couldn’t adapt to city life, and so went home to Ganmain – where, alternating through both key forward posts, he won consecutive Best and Fairest awards in 1959-60. Although he was relatively slimly-built, and short for a key forward at 184 cm, Carroll was a fine reader of the game, quick off the mark and a reliable shot for goal. At his best inside 50 metres, he played from the goal square, and timed his leads superbly – as he showed in his dazzling debut match for the Blues in round 1, 1961 at the Junction Oval, when he handed out a football lesson to St Kilda’s champion full-back Verdun Howell. Tom kicked five goals that afternoon, steering Carlton to a 10-point win. It was a super first-up performance in the number 22 guernsey - the same number worn many years before by Carlton’s greatest goal-kicker; Harry ‘Soapy’ Vallence. Although his new team found wins hard to come by throughout his first season, and wound up the year in eighth place, there was plenty to like about Tom’s consistent exploits up forward. He didn’t miss a game, kicked five goals or more four times, and fittingly, led the League’s goal-kicking table with 54 majors. And when Carlton’s tenacious defender Johnny James was awarded the 1961 Brownlow Medal as the Fairest and Best player in the competition, it turned out a memorable year indeed for the Navy Blues. Strengthened in 1962 by some additional quality recruits like Ian Collins, Graeme Anderson, Martin Cross and Gordon Collis, Carlton climbed back into flag contention. The top four teams after the home and away rounds were Essendon, Geelong, Melbourne and Carlton, but the flag race was wide open and the finals series was one of the most even in VFL history. The Navy Blues kicked off their campaign, and Carroll experienced the electric atmosphere of his first finals match at the MCG, when Carlton edged out Melbourne by two points in the '62 first Semi Final. That pulsating match was followed by a sensational draw with Geelong in the Preliminary Final, and a controversial win by two points in a desperately hard-fought replay. After all that, Carlton fell to a fitter and fresher Essendon in a somewhat anti-climactic Grand Final. 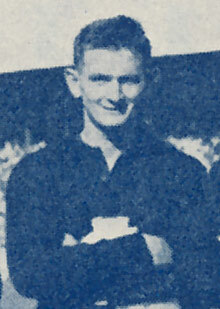 Still, Carroll’s contribution of 62 goals for the year improved on his debut season, and left him just six short of Geelong’s star spearhead Doug Wade, who topped the League table with 68 majors. Tom’s third season in 1963 proved less fruitful, as opposition teams worked hard on strategies to counter him, and he was subjected to a lot more physical pressure. He was concussed twice, and limited to 15 matches for the year, while the Blues were narrowly beaten in a string of important games and slipped out of finals contention to finish sixth. By late in the year, Tom had had enough of life in Melbourne, and was looking forward to returning home to the wide open spaces. “I loved the footy, but I never got used to getting to work through all the traffic in the big city,” he later explained. Tom’s last game for Carlton was one that he would fondly remember. Playing Footscray at Princes Park in round 18, 1963, the Blues trailed the Bulldogs by five points at three-quarter time, before they unleashed a withering burst of eight goals to two, and pulled off a spectacular win by 32 points. Carroll and centreman Berkley Cox both kicked four goals to lead the assault. John James also played his last match for Carlton that day; farewelled to take up a lucrative offer to captain-coach Sunraysia League club Robinvale. Back at Ganmain, Carroll relished his return to the local league, and became a Riverina football legend over the ensuing two decades. In a highlight of his comeback season, he helped the combined Riverina team win the Victorian Country Football Championship, by defeating the powerful Ovens & Murray League in one Semi-Final, before knocking off the hot favourite Hampden League in the Grand Final. Later that year, Carroll kicked his 102nd goal of the season with a curling snapshot in the last minute of the South West League Grand Final against Griffith, to get his team home by two points in a celebrated decider. Remarkably, four of the Carroll brothers played in that Premiership side, with another two in the seconds team. Precisely twelve months later, Carroll was awarded his fourth Premiership medal after Ganmain defeated Griffith again in the 1965 decider, only this time by a more emphatic margin. In 1968, Tom crossed to neighbouring Grong Grong-Matong as captain, before retiring as a player at the age of 30 the following year. Then in 1982, a major restructuring of NSW country football took place. Ganmain and Grong Grong-Matong merged, and the new club became a member of the Riverina Football League. Tom was asked to take on the role of Under 19 coach, and under his stewardship, the fledgling club won three of the first four flags in the thirds competition. A couple of years prior to Tom’s first foray at Princes Park, his brother Laurie "Dooley" Carroll played 11 games with St Kilda. Laurie’s son Dennis Carroll, and another of Tom’s nephews; the high-flying Wayne "Christmas" Carroll, both went on to fine careers with the Sydney Swans. Wayne played 56 games between 1979 and 1985, while Dennis captained the Bloods for seven seasons and played 219 games from 1981 to 1992. And like his distinguished uncle Tom, Dennis represented both Victoria and NSW during his career. Carroll also wore guernsey No. 43 during a brief run with Carlton Reserves in 1959. Contributors to this page: Grisdesa , PatsFitztrick , Bombasheldon , Jarusa , molsey , MickJuice , tmd1 , keogh , true_blue24 and admin . Page last modified on Thursday 26 of July, 2018 23:31:06 AEST by Grisdesa. 2003 National Draft Bio - Murray Boyd Pleming (Nov 03).